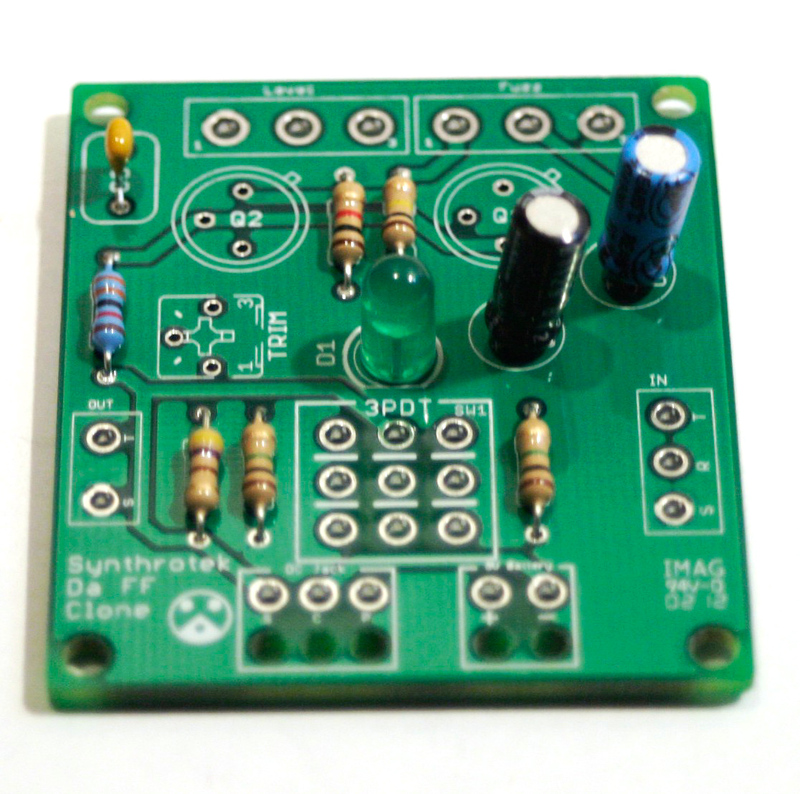 Welcome to the Genuine Arbiter Fuzz Face Clone Kit Instructions! 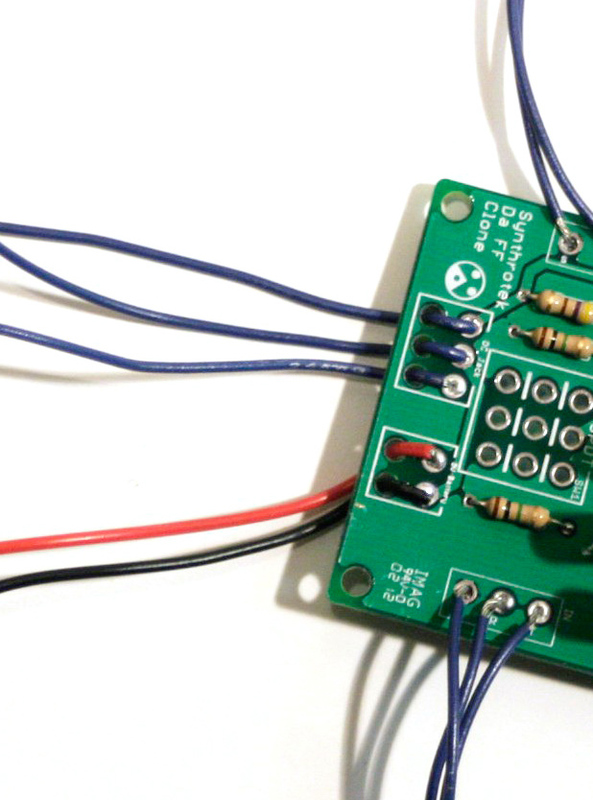 It’s a great circuit and it’s an easy build, so let’s get started! 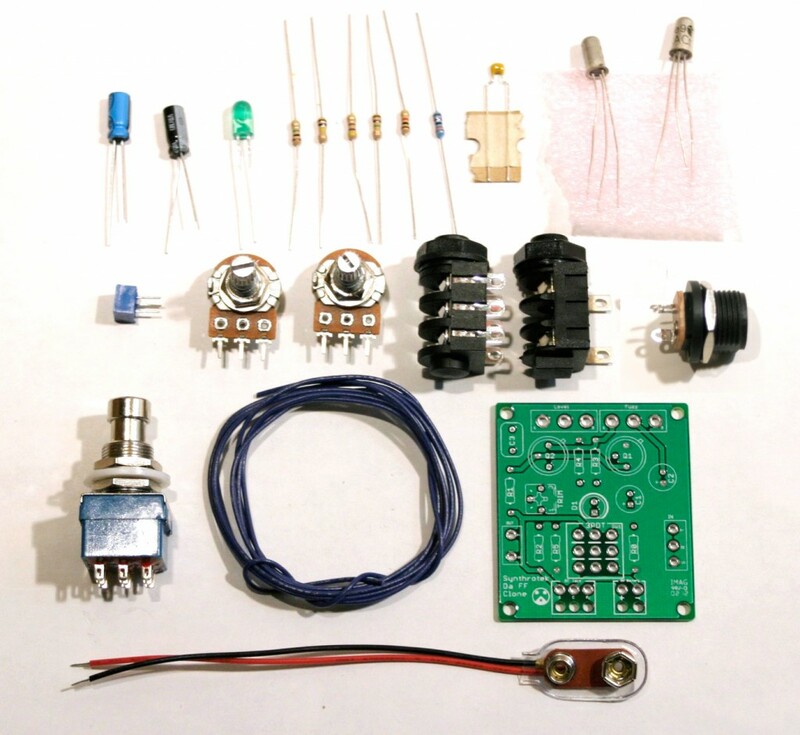 This kit can be purcahsed with either Germanium AC128 PNP transistors or BC588 Silicon PNP transistors. 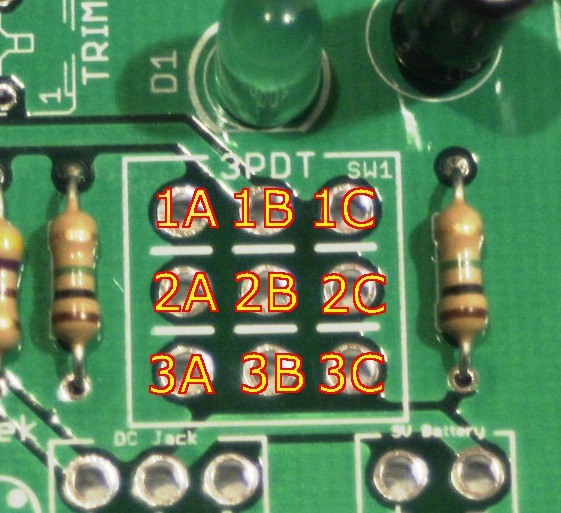 Locate the silkscreen component identifiers for R0, R1, R2, R3, R4, and R5. Insert each resistor into the correct through-holes and solder them to the board. When placing C1 and C2, use the picture above to help you position these electrolytic capacitors. Note the black band; this indicates the negative polarity lead of the capacitor. To further assist you, the PCB has a ‘+’ and a square through-hole for the positive lead and a circle through-hole for the negative lead. C3 is a ceramic capacitor and it does not matter which lead goes into which hole. Pay special attention when placing the transistors onto the PCB. 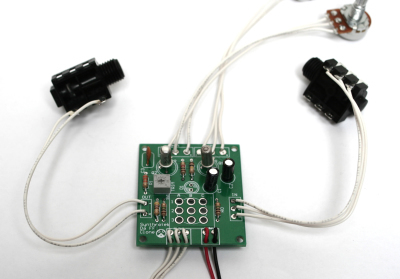 Each of the three leads has a specific function and the circuit will not work if they are placed incorrectly. Germanium transistors: Line up the little tab on the transistor with the tab on the board as shown in the first picture above. Q1 gets the lower gain transistor (if you are using Synthrotek’s transistors, it will be marked with a black dot). Q2 gets the higher gain transistor. When using the silicon BC558 transistors, follow the orientation in the second photo. The trimpot has three leads. Orient the trimpot as shown in the picture above and insert the leads onto the PCB. 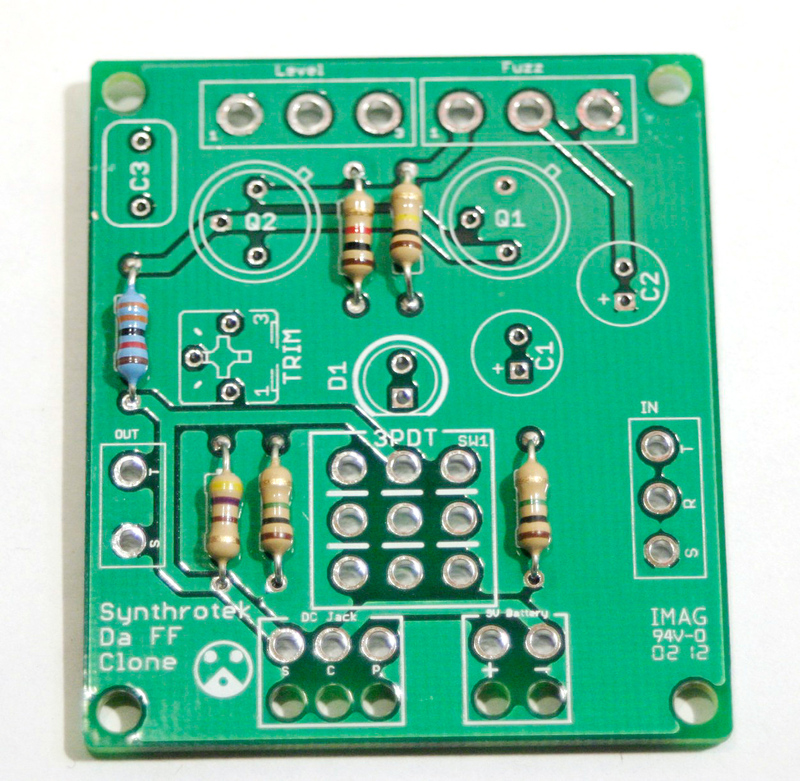 If the leads are bent, gently bend them to conform to the through-hole layout on the PCB. Once the circuit is completely built, you can adjust this trimpot to color your sound to your needs. That is all for on board components. Wire the pots exactly as shown in the picture above (the top one is the A500k and the bottom is B1k). Make note that the B1k pot is reversed from the orientation that most of our pots use. 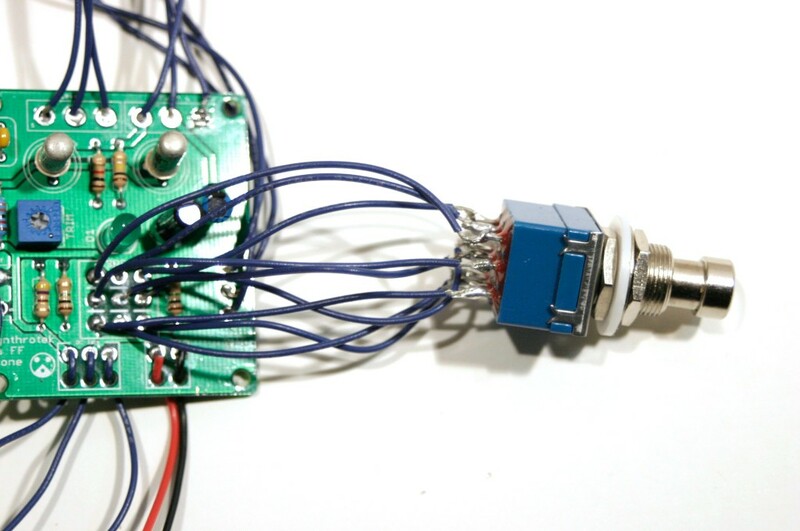 We suggest soldering wires to the potentiometers before attaching them to the PCB. 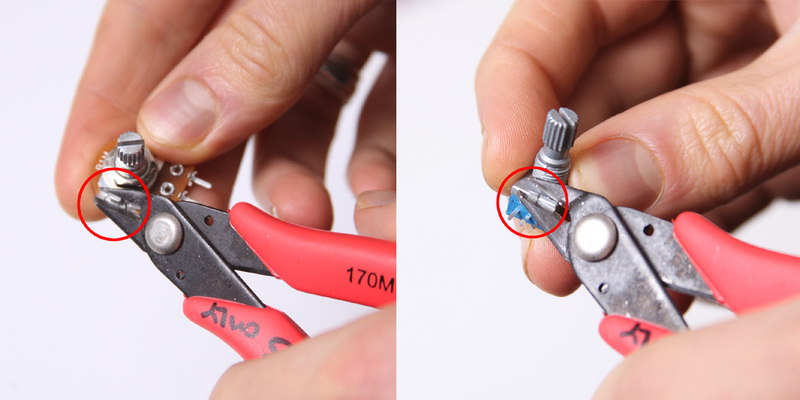 Having to de-solder a too-short wire from the PCB is an extra step that can be avoided. As always, use more wire than you think you will need; wire can always be cut. The ‘In’ Jack of the Arbiter Fuzz Face Clone circuit uses a 1/4″ stereo jack which turns off the power sources when nothing is plugged into it. When you plug a mono plug into the jack, the circuit receives power. Stereo jacks have three solder lugs for the 3 different parts of the stereo signal: Tip, Ring, and Sleeve. On the PCB, they are identified as ‘T’, ‘R’, and ‘S’. 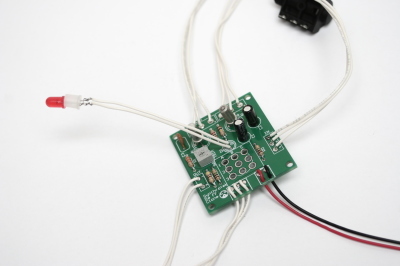 Attach each solder lug on the jack to their respective PCB connection. Make sure to use the solder lugs as pictured above. On the other side of the board is the ‘Out’ PCB connections. They are marked ‘T’ and ‘S’ for ‘Tip’ and ‘Sleeve’. Mono jacks only have these two connections, so they are easy to wire up. 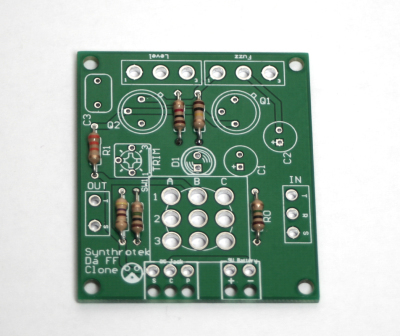 The 9V battery jack is easy to put onto the PCB. Take the red wire and insert it into the square through-hole with the silkscreened ‘+’. The black wire goes to the circle through-hole marked with a ‘-‘. 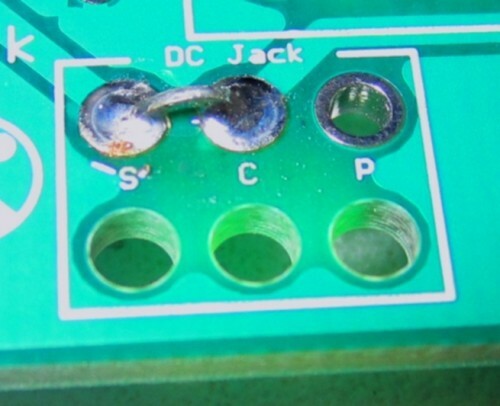 The DC Jack has three solder terminals that connect to the PCB. Use the picture above and the silkscreen on the PCB to place the wires correctly. The DC Jack allows you to power your circuit with a wall wart and disconnects the 9V battery from the circuit, saving money on expensive batteries. NOTE: please remember to use a 9 volt center positive power supply. Using the incorrect power supply polarity will damage your circuit. Insert the LED through the plastic insertion mount (if needed) and solder wired leads to both legs. Connect the wire leading from the flat side of the of LED to the solder pad on the board that is closest to the flat spot on the silkscreen. The picture below shows the flat spot (although the led is board-mounted). 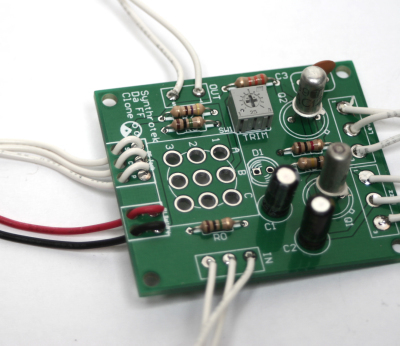 You may omit wiring the LED and mount it directly to the PCB. 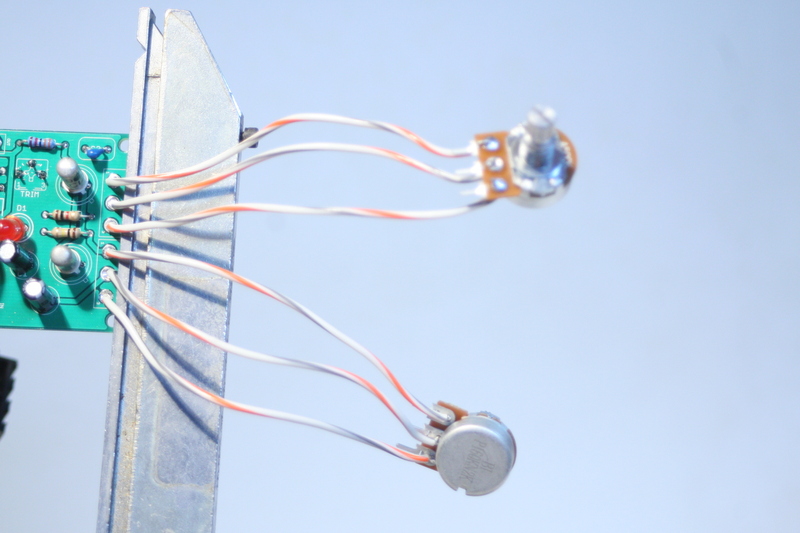 The photos below illustrating stomp switch wiring show the LED installed in this configuration. Make sure the flat blue side of the stomp switch is facing up when comparing it to the picture below. Either Blue Side will work fine. AND YOU CAN MOUNT THE STOMP SWITCH DIRECTLY TO THE PCB IF DESIRED. Power on the pedal and insert a cable into the input jack. For the circuit to be optimally biased, the collector of Q2 needs to be at 4.5 volts. (When connecting the Arbiter Fuzz Face Clone circuit to your multimeter as shown in the photos below, your meter will read -4.5V.) The 20K trim pot is used to dial in this value. All you need to do is connect your leads to a ground on the PCB and the collector of Q2 to get this reading. 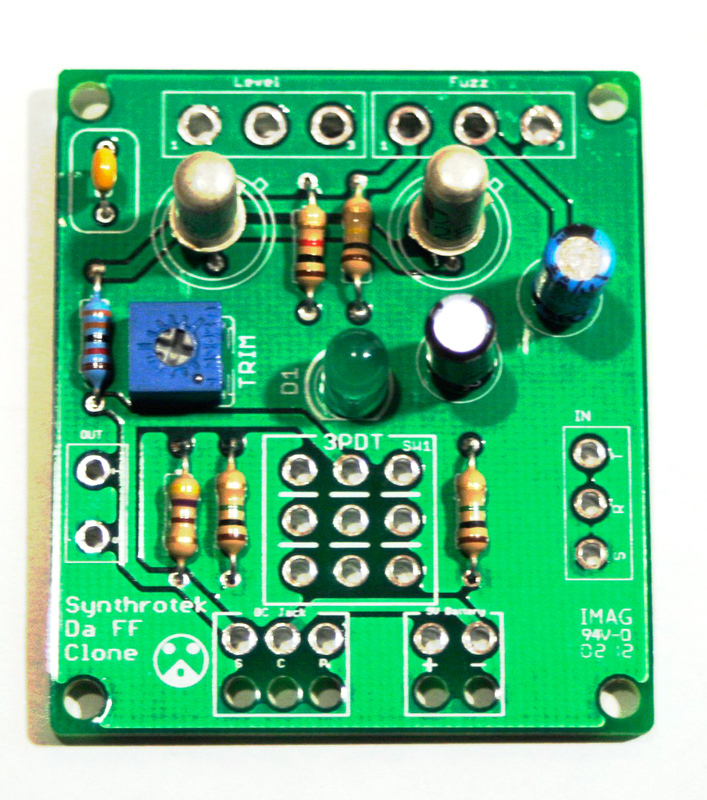 Congratulations, that’s the end of the instructions for the Arbiter Fuzz Face Clone circuit! If everything is wired/connected properly, you should have a fully functional fuzz pedal. Remember to adjust the trimpot to get the sound you want from your new pedal and have fun! I just purchased this kit about a week ago, and I have a question about the power supply I need. The assembly instructions state that it requires a center positive power source. I have a planet waves 9v adapter for boss and similar pedals, but that one won’t work right? Do you have any recommendations? I’ve been having trouble finding an adapter that would power this pedal. About the second stomp switch picture, does it matter which flat blue side is facing up? Hi Jordan, either blue side will work the same. Great question, should have had this on the instructions a long time ago! I recently finished building this pedal — when I first tested it out, it sounded great. Exactly what I was hoping for. However, the LED wasn’t working. I am pretty new to soldering and didn’t realize the polarity of the LED mattered. In the process of removing the LED, I think I must have damaged/overheated the board, because when I finally got the LED working and re-tested the pedal, it sounded screechy and thin— in a word, terrible. So now I have a basically unusable pedal. It is for the most part my fault, but I think it would be very helpful to include a quick mention of how to install the LED, so that beginners can avoid the mistake which I made. Sort of disappointed. 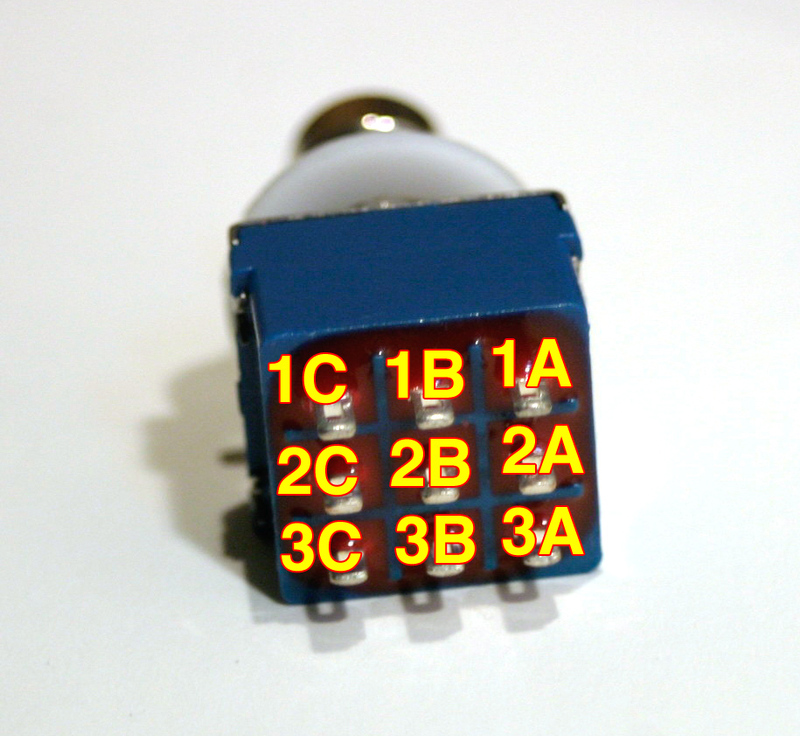 Sorry about the confusion on the LED mounting, getting the instructions fixed is happening soon. Thanks for pointing it out to us! As far as why it suddenly sounds screechy, there are a number of things that affect the sound of the Fuzz Face Clone, mainly the germanium transistors, which are VERY temperature sensitive. The AC128s that we use have a maximum temperature of 100*C, so a very hot iron could very well damage them. Another thing is the Trim pot. Potentiometers are also easy to cook with a soldering iron thats too hot, or left on the board too long. If you turn the trim pot, does it change the tone at all? Thank you for the response. The trim pot does change not drastically change the tone. I am just going to buy the kit again and start from scratch. I’m pretty sure you can just switch the + and – wires to the power supply plug and you get a negative center powered pedal. Am I right? From the board it looks like the DPDT stomp switch (and LED) can be mounted directly on the board, but the instructions show otherwise. Is that possible? Also I assume there’s no harm in switching the wires to the power plug so it works with negative center power supplies (far more common)? Not so fast! you CAN wire it as a center negative, BUT you cannot use other center negative pedals if you are daisy chaining pedal power. I recently purchased the Fuzz Face PCB. 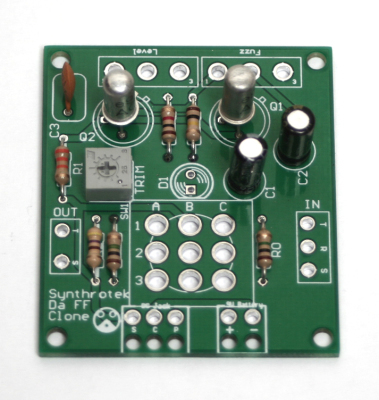 I am using a 9v jack for the dc input, it has the center positive as directed, from a Big Muff. The schematics look to be showing that the jack switches the negative lead when it is plugged in, but my jack switches the positive. Am I reading this wrong? Can you please clear this up for me, I would hate to fry my circuit. The S,C,P wires shown connect the P terminal to the pin which is positive, but on the board the p and the negative battery terminal have continuity. Help!! Hi Paul, the “P” connection for the DC jacks has continuity with the “+” battery terminal. The “C” has continuity with the “-“. When the DC jack is open, C and S are connected allowing the battery to function. Does this help? My DC jack is open between C and S when no power supply is plugged in, so the battery is not connected until I plug something into the DC jack, whether or not the adapter is connected to the AC. The pedal works with no battery if the DC is connected and plugged into AC. It seems the DC jack (C/S) should be normally closed, then become open when the adapter is plugged into it, but this isn’t the case. Any help? Hi Andy, did you receive the DC jack from us? The ones that we sell and provide in kits have C & S connected when there is nothing plugged into the jack. Yes, I bought the complete kit from you. Measured in circuit, C & S are open until something is plugged into the jack; maybe it’s defective? With nothing plugged in and a 9 volt battery connected, I get very low output and no LED. As soon as I plug in the DC plug (not even hooked to mains), the LED comes on and I get full volume. Or the pedal works fine with no battery, using power adapter. I just assembled my Fuzz Face. While I am able to get a clean, bypassed tone out of it, pressing the stomp button makes it go quiet– all sound is cut off. I am wondering if one of the transistors is either malfunctioning, or if I accidentally fried it during soldering. Have any other customers experienced this problem? I bought two kits, and would like to learn how to avoid doing whatever I may have done wrong on the first one. Hey, I’ve noticed that actually on one that I built awhile back, Turned out to be a cold solder joint on one of the transistors. Though any number of things could possibly be the issue. You can check out our troubleshooting guide here, but I would definitely check solder joints and component placement first. Feel free to email us at synthroteksales@gmail.com for further help or if you want to arrange a repair. 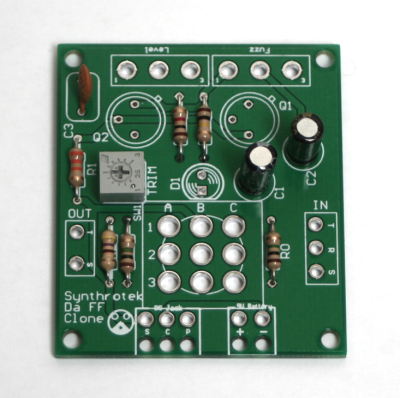 Is the Fuzzface kit designed for PNP or NPN Transistors? Also, is there a ‘standard’ schematic available w/o the unprintable black background? Hey tom, we’re using PNP AC128 Germaniums. Unfortunately, that’s the only schematic available. The discrepancies you see on the schematic are just a revision difference between the original schematic and the final product. The 2n1305 is still a PNP Germanium transistor, so it will function, but there may be tone variations. Well, I finally finished it, and it worked first try. My one question is, how does the trim pot affect the sound? The trim pot affects the bias of the transistors, so that you can match them and make it sound better. The input and output jacks are different than the ones shown in the instructions but are correct in the bom Can you describe or illustrate the wording on the metal vs the plastic jacks? We recently switched to the metal jacks, and must have missed this assembly instruction page. Please reference the following images to get you hooked up right. I am thinking of adding some extra components to lower the incoming voltage. would adjusting the bias control do the same thing as say, lowering battery voltage? I have seen some fuzz pedals that have an outside adjustable bias pot, but none that allow you to lower the voltage. I have read that some people would experiment with the lower voltages affecting the sound. The plan is to use a rotary switch (6 position) and use 5 diodes in series terminating on the rotary switch poles. This would allow me to turn the rotary switch to achieve: 9 vdc, 8.3 vdc, 7.6 vdc, 6.9 vdc, 6.2 vdc, 5.5 vdc. I can think of a dozen other ways to do this, but this one is dirt simple, and won’t drain the battery. what do you think? You’re essentially looking to make a starve circuit, I would consider building it into a separate enclosure, as you could then use it with other pedals too, if you look around on the internet, there should be plenty of circuits out there you can look at for ideas. I was wondering on the fuzz if the 3PDT Switch can be mounted on the back side of the pc board (solder side of board)? Seems to be great kit and cant beat the price. Thanks. The 3PDT needs to be mounted on the top of the board for it to work correctly. You can, however mount the trim pot on the other side of the board, if thats what you are wanting to do. We unfortunately cannot release schematics for this due to licencing and contractual obligations. Got it yesterday; built it this morning. Like another I wired the LED backwards. I made another bonehead mistake so boneheaded that I will not confess it here. But after correcting both, I can only say this pedal in Germanium AC128 PNP is fabulous. I had always wanted an “original” fuzz face but then learned that when a music store got a shipment, the local hotshot guitarist picked over many to find the one that sounded best. Apparently, the originals were not made with the best AC128s. Mine is better than the one they got!! Awesome! Happy it all worked out John! In the picture used in your biasing instructions, if the tab on transistor Q2 is oriented to match the tab indicator printed on the pcb, then the emitter is a 12 o’clock, the collector is at 6 o’clock and the base is at 9 o’clock. Your photograph shows the multimeter connected to the base (9 o’clock) not the collector. But the instructions say to adjust the bias voltage to the collector. Am I mistaken? Having a similar problem as mentioned above. Get clean signal fine, but goes silent when switched to fuzz. LED does not light up with battery, but does light up with DC adaptor. Voltage tested all connections and they all check out as good. Don’t think I fried the circuit, though I had to redux the pot connections and the input jack (as I initially had it wired incorrectly). HELP! If I get a chance to look at the board maybe something will stand out and I can offer further assistance! We also offer a free 30 minute repair/diagnosis for kits! This doesn’t seem to make sense. Why can’t you re-wire to make it center negative and use a common, daisy chain power supply lead with negative center plugs? Please explain why you could daisy chain with center positive but not center negative. I’m putting this in a guitar I’m building and was wondering how I would go wiring in a switch instead of the 3pdt? Hey Steve, that sounds like a wicked project!